The Archives and Special Collections Center is launching a new Adopt a Book program! This program gives donors the opportunity to contribute to the conservation of specific items from our collection that interest them. Each month, we will feature a different adoptable book here on our blog. To learn more about the program, or to make a donation, please visit our Adopt a Book page. The vast catacombs of Rome provide a critical link to the past. Because they were shielded from the elements and remained nearly untouched for centuries, they have yielded spectacular examples of early Christian art, insight into the culture and burial practices of Rome, and stunning architectural elements. These catacombs were nearly lost to history, but were accidentally rediscovered in 1578 by laborers working in a field on the outskirts of Rome. Antonio Bosio was born in Malta in 1575, and spent most of his life in Rome. He became interested in the catacombs at an early age, and read any text which he thought might give him some insight into the subject, including ancient records in Greek and Latin, ecclesiastical histories, lives of the saints, and theological treatises. Bosio continued his work for 36 years. He devoted his life to it, and was one of the first to apply systematic methods of the newly forming science of archaeology to the study of the catacombs. In 1629, Bosio died at the age of 54 without finishing his work and bringing it to print. For a short time, it seemed that Bosio’s life’s work might never see publication. However, the Knights of Malta, to whom he had left his estate, recognized the importance of his research and entrusted Oratorian Giovanni Severani with editing and compiling the work. 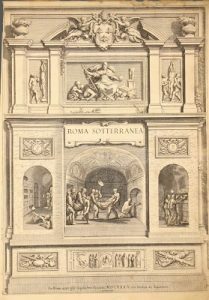 It was finally published in 1632, three years after Bosio’s death, in a large folio volume titled Roma sotterranea: opera postuma di Antonio Bosio. Bosio dedicated his life to discovery, scholarship, and above all advancing our understanding of the archaeology of ancient Rome. While Bosio never saw his work come to fruition, it still lives on over three centuries later. No archaeological study of the catacombs can commence without paying homage to Bosio. The Archives and Special Collections Center holds a rare 1632 edition of Roma sotterranea. 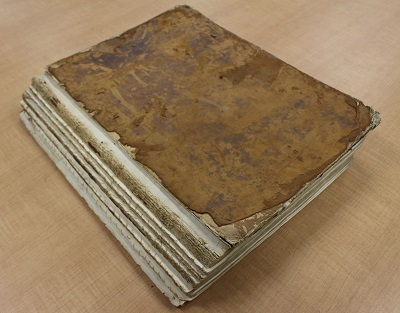 The book is showing its age (384!) and is badly in need of conservation treatment to ensure its preservation for years to come. You can help support the conservation of this important work! Any donation toward preservation of this rare volume would be gratefully accepted. To donate, please visit our Adopt a Book page. Next Next post: Archives and Special Collections + University Weekend Activity Map . . .